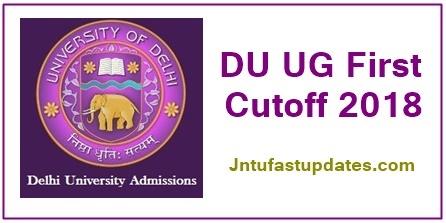 The University of Delhi has released the DU Degree Cutoff list 2018 today on its official portal, du.ac.in. The DU 1st cutoff for Graduate Degree courses such as B.Sc, B.A, B.Com, Arts, Commerce and Science branches was released. More than 3 lakh candidates seeking admission in Delhi University have applied for the Graduate Degree admission for the academic year 2017-18. Candidates hoping to get admission in DU can check the DU UG 1st Cutoff list 2018 today i.e on June 18th. Candidates can switch to the official website, du.ac.in to check the list. The University of Delhi popularly known as Central University was established in 1922. The University was established by an Act of the central legislative assembly. Every year huge number of hopefuls seeking admission in Delhi University. It offers various UG & PG Courses in various streams. The DU has recently released a notification for UG Admissions. More than 3 lakh candidates applied for the admissions in DU. The DU has accepted applications in may to june. Students who qualified with the selection process will get admission into University of Delhi and its affiliated colleges. The DU has released the Degree 1st allotment list college-wise, branch-wise. Students waiting for the DU Degree 1st round allotment can now check the list from du.ac.in. The DU will release the UG 2nd cutoff list on 25th june, 3rd cutoff list on 30th june, 4th cutoff list on 6th july and finally, the degree 5th cutoff will be released on 12th July. Candidates who did not get shortlisted in 1st round cutoff list can wait for the next rounds. Candidates can check the Delhi University Degree 1st cutoff 2018 result from the official portal, du.ac.in right now.